Rumors had been flying about GMC adding a Denali trim level to the Canyon mid-side pickup since its introduction for 2015. Heck, even GMC’s vice president of Sales, Duncan Aldred, has been quoted as saying he wants the range-topping trim level added to the mix. It makes perfect sense, too. Every other GMC product offers the upgraded luxury version with distinctive exterior styling and swanky interior adornments – save for the Savanna van. What’s more, the Denali trim is said to account for roughly 25 percent of GMC sales, meaning customers crave that upscale appearance and feel. Those rumors got even hotter when spy photographers snagged a Canyon test mule wearing insanely thin camouflage and upgraded wheels. 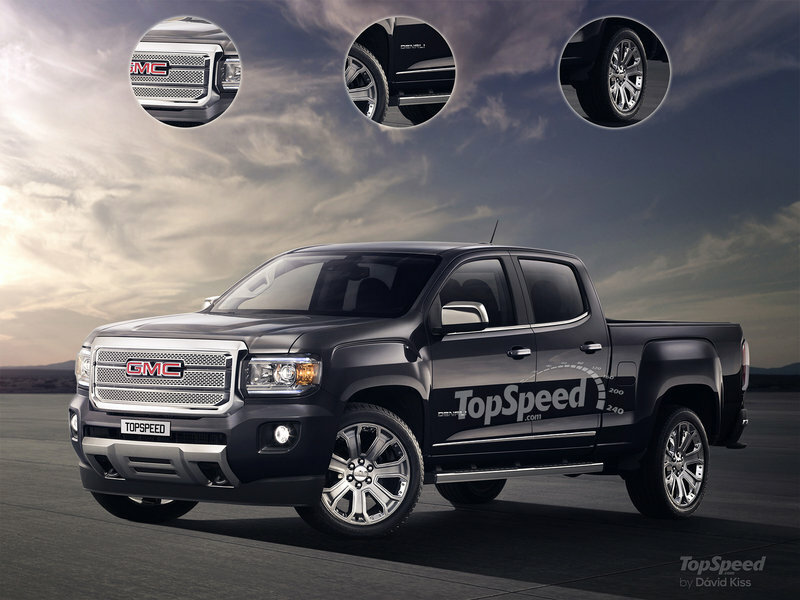 We here at TopSpeed took what we saw and created a rendering of what a Canyon Denali might look like. Thankfully, the wait is over. 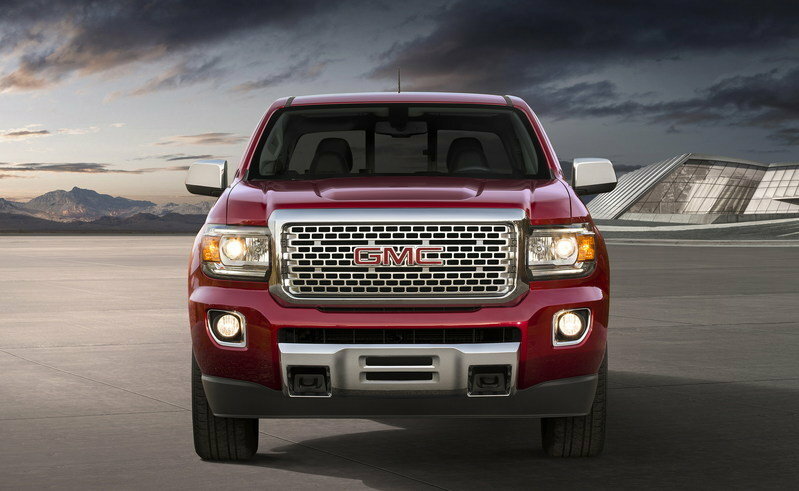 GMC debuted the “professional grade” luxo-truck at the 2015 LA Auto Show. And just as we suspected, the Canyon Denali comes loaded with features and amenities that are otherwise unavailable or optional extras on lower trim levels. The now-iconic cheese grader chrome grille is paired with 20-inch ultra-bright aluminum wheels and Denali badging to denote the trim level’s range-topping status. 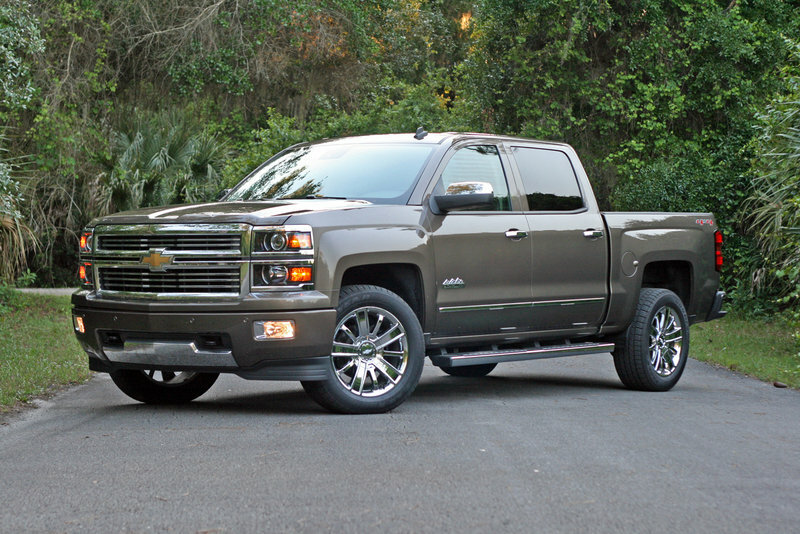 Providing power is the 3.6-liter V-6 as standard, while the new-for-2016 2.8-liter Duramax turbodiesel is offered for customers who want an extra 700 pounds of towing and the EPA-estimated 31 mpg highway. Updated 11/17/2015: GMC dropped the 2017 Canyon Denali at the 2015 Los Angeles Auto Show. Read more about the 2017 GMC Canyon Denali. Many of the changes wrapped into the Denali trim are visual updates to the exterior. The most obvious is the bright mesh grille juxtaposed to the red GMC lettering. HID headlights with LED daytime running lights are also present, though they can already be found on the Canyon’s current top trim, the SLT. Now standard are fog lights, tow hooks, and the spray-in bed liner, along with chrome accents on the mirror caps, door handles, side steps, and bumpers. Matching the chrome accents are the new 20-inch wheels. The ultra-bright, machined aluminum wheels are new for GMC, but look like other wheels in the Denali lineup, helping tie the different models into the same high-end family. As we suspected, the Denali trim does not change anything major with the body. All the usual panels are still in place, and the truck still retains its usability, both in towing and hauling. Six color options are available. 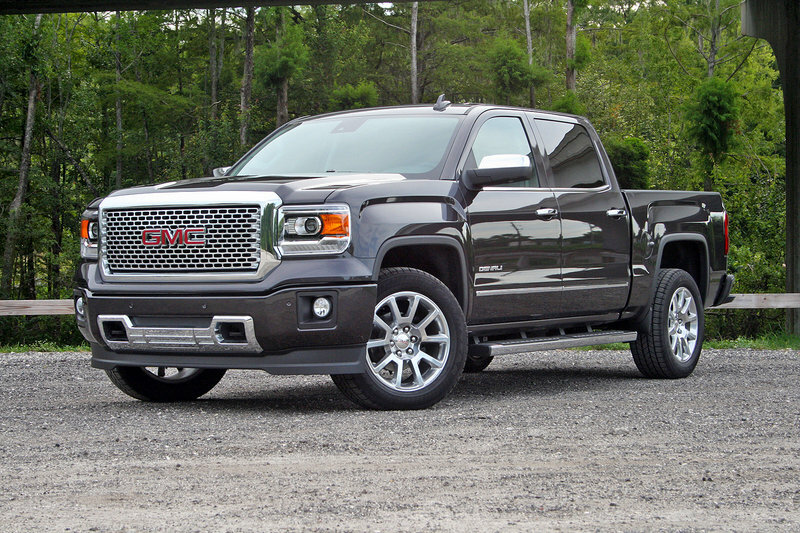 The Canyon Denali is only available in Crew Cab form. While looking good is part of the Denali experience, much of the Denali hubbub centers on the interior refinement. 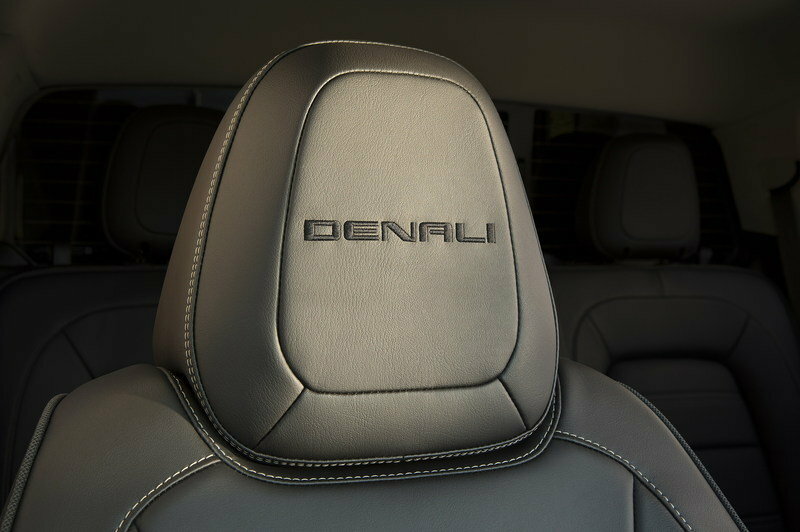 The truck now has perforated leather front seats with both heating and ventilation, topped with the Denali logo stitched into the headrests. The leather appointments continue onto the dash, held in place by contrasting French stitching. Upgraded wood accents on the center console and door panels help bring even more luxury to the cabin. Other bright accents include the aluminum trim on the center console and along the steering wheel spokes. Of course, the Denali gets all of GMC’s current technology. 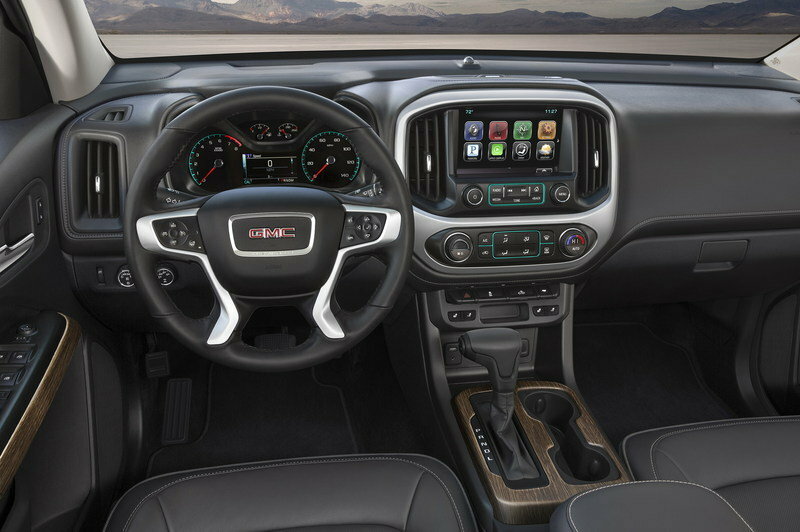 The eight-inch touch screen with GMC’s IntelliLink software comes standard and features Apple CarPlay, Android Auto, and 4G LTW Wi-Fi service. Automatic climate controls, a heated steering wheel, remote vehicle start, and Denali-branded, illuminated sill plates are also present. On the safety side, the Denali trim also makes Forward Collision Alert and Lane Departure Warning standard. Since the Denali trim tops the Canyon’s trim levels, the base 2.5-liter four-cylinder isn’t found here. The 3.6-liter V-6 is the standard engine with the 2.8-liter Duramax turbodiesel being the optional upgrade. The six-speed automatic will be the only transmission choice. 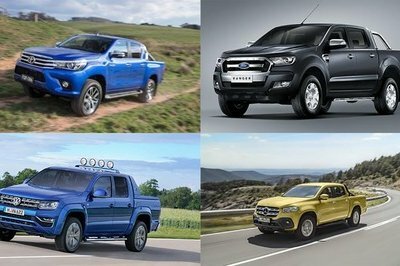 The truck will come standard with 2WD, but trucks equipped with 4WD will get the usual electronically controlled transfer case. 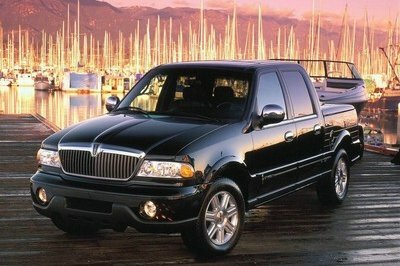 The familiar 3.6-liter V-6 produces 305 horsepower and 269 pound-feet of torque. The familiar 3.6-liter V-6 produces 305 horsepower and 269 pound-feet of torque. The V-6 allows the Canyon to pull a maximum of 7,000 pounds on its hitch, when properly equipped. Payload is rated at an impressive 1,590 pounds. 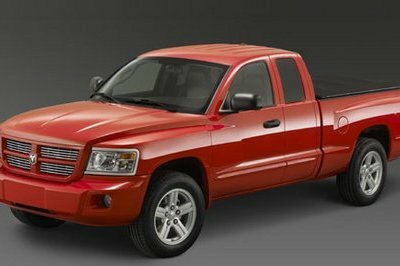 The EPA rates the V-6 Crew Cab with 4WD at 17 mpg city, 24 mpg highway, and 20 mpg combined. Opt for 2WD and the Canyon gets an EPA-estimated 26 mpg highway. 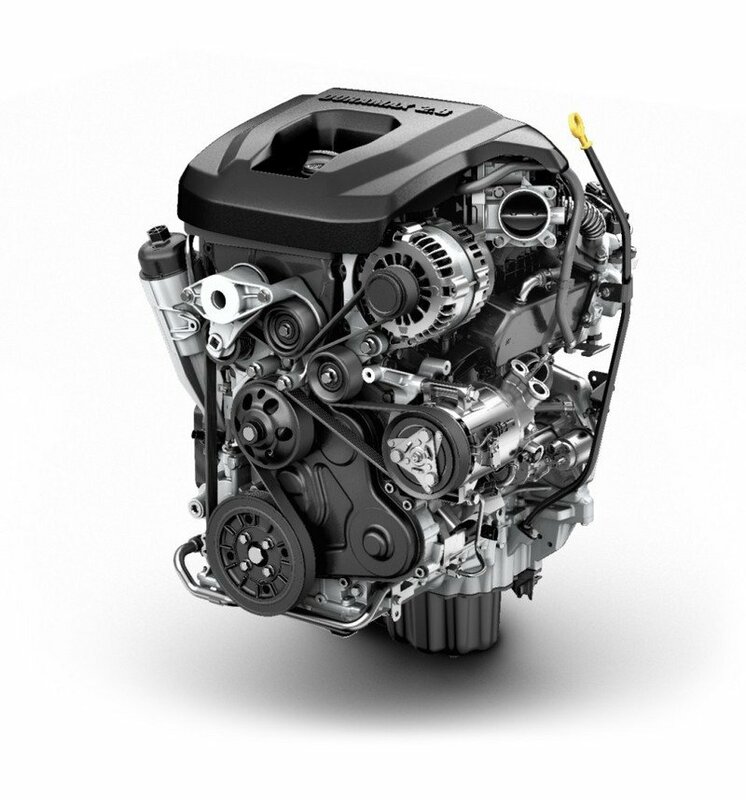 The new 2.8-liter Duramax four-cylinder turbodiesel is the engine many have been waiting for. Announced when the Canyon made its original debut back in 2014, the engine was expected to be a torque monster and fuel miser. Thankfully, the engine has lived up to both expectations. The “baby Duramax” puts out 181 horsepower and 369 pound-feet of torque, allowing a 2WD truck to pull 7,700 pounds worth of trailer. 4WD Canyons only lose 100 pounds worth of trailering capability. Best of all, the Duramax-equipped Colorado in 2WD guise achieves an EPA-estimated 22 mpg city, 31 mpg highway, and 25 mpg combined, making the Canyon and its Chevrolet twin the first trucks to surpass the 30-mpg glass ceiling. Opting for a 4WD Canyon lowers the EPA’s estimates to 20 mpg city, 29 mpg highway, and 23 mpg combined. Not bad at all. GMC has yet to announce pricing for the 2017 Canyon Denali, but we can still speculate as to what its base MSRP will run. Opt for the SLT trim package, the Canyon’s current range-topping trim, and prices start at $34,000. 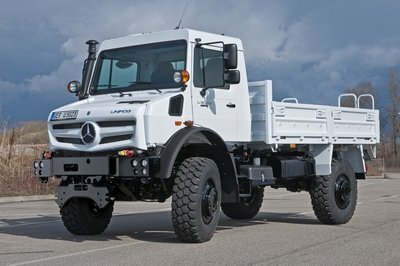 That’s for the Crew Cab version with the short bed. Check all the boxes on the SLT, and prices grow into the low $40,000 range. That’s where the Canyon Denali’s price will start. I’d venture to speculate pricing would begin at $41,900. GMC does tell us the Canyon Denali will go on sale in late 2016 as a 2017 model. Ok, so Chevy doesn’t make a Colorado High Country currently, but that might change in conjunction with the Canyon Denali. The range-topping High Country would provide a nearly equivalent level of refinement and luxury for Colorado buyers, but just with less flash. If the High Country trim never makes it to the Colorado, then Chevy buyers are left with the LT as the most luxury-minded trim. Of course, all the mechanicals are identical between the trucks, including the use of the 3.6-liter V-6 and 2.8-liter Duramax. Going out on another limb here: I would bet money a good majority of folks buying the Canyon Denali really want the Sierra Denali, but in a smaller package that actually fits in their garage. The Canyon Denali buyer isn’t the mid-30 something who wants to mountain bike on the weekends with his buds. That’s who buys the Colorado Z71, Toyota Tacoma, and Nissan Frontier. No, the people buying the Canyon Denali are the doctors and lawyers of Suburban America who want a “right-sized” truck with all the features they’re used to having in their other Denali-branded vehicle – probably the one they plan on trading in. I might be assuming too much, but that’s the way I see it. The Denali-fied version of the Canyon makes perfect sense. 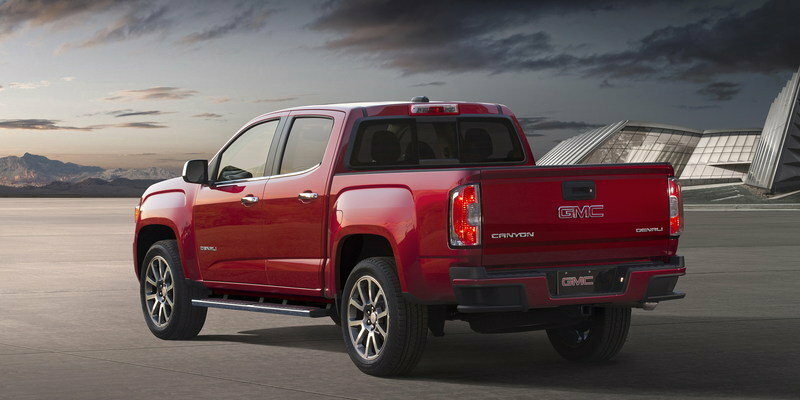 It matches the rest of the GMC lineup, brings added value to the Canyon for upper-crust buyers, and helps move the mid-sized trucks off the lot at a faster pace thanks to its desirability. More than anything though, super high trim levels typically bring big profit margins – something every automaker goes wild about. GMC seems to have done all the right things with the Canyon Denali. Now we’re looking forward to getting behind the wheel. 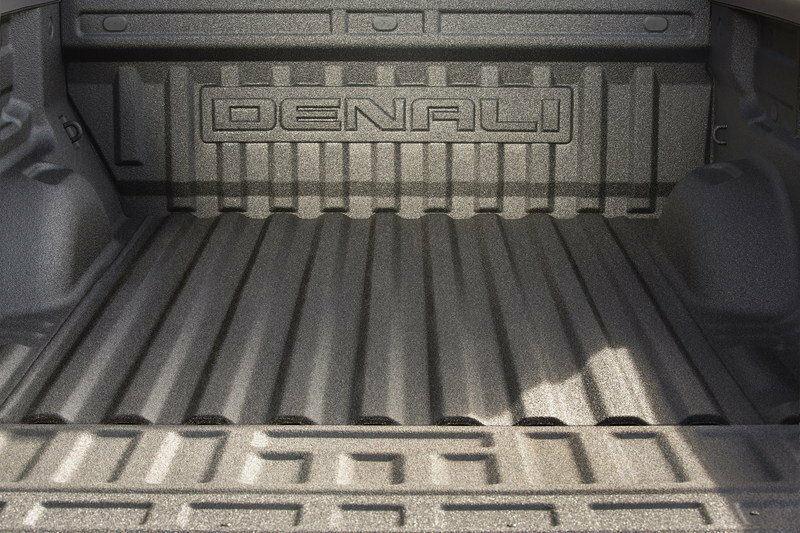 Denali is the ultimate expression of GMC’s professional grade style, luxury and capability – and it is coming to the Canyon midsize truck. The 2017 Canyon Denali is being introduced today, ahead of its public debut at the Los Angeles Auto Show. It goes on sale in late 2016. Like all Denali models, the new Canyon Denali is distinguished with a unique chrome grille and unique wheels – 20-inch ultra-bright-machined aluminum wheels with painted accents. Exterior cues include chrome fog lamp bezels, five-inch-diameter rectangular chrome assist steps, a polished exhaust tip and a standard spray-in bed liner. The Canyon Denali will be offered in six exterior colors. Inside, a Jet Black interior features Mulan leather-appointed seats with perforated, heated-and-ventilated front seats – exclusive content in the Canyon lineup – along with unique instrument panel and console trim; and Denali-logo sill plates and floor mats. Two USB charging ports on the rear of the center console ad another USB port inside the console. 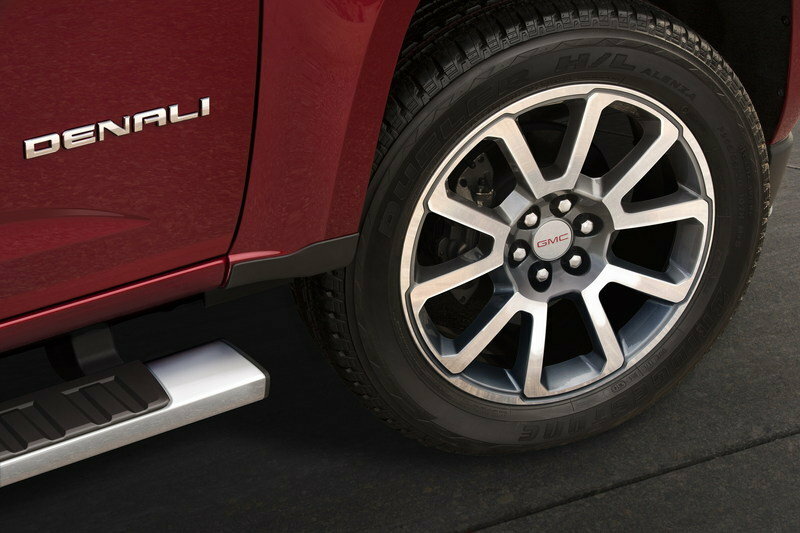 The Canyon Denali is offered on crew cab models and in two-wheel drive or four-wheel drive configurations. Powertrains include a standard 3.6L V-6 that tops competitors’ V-6 offerings with up to 7,000 pounds (3,175 kg) of maximum trailering and an Environmental Protection Agency-estimated 26 mpg highway on 2WD models. Also available is the all-new 2.8L Duramax turbo-diesel, which includes a maximum trailering rating of up to 7,700 pounds (3,493 kg) and EPA-estimated fuel economy of 31 mpg highway (2WD). It is the cleanest diesel truck engine ever produced by General Motors and meets some of the toughest U.S. emissions standards, thanks in part to a cooled exhaust gas recirculation system. The engine is paired with the Hydra-Matic 6L50 six-speed automatic transmission, which uses a unique Centrifugal Pendulum Vibration Absorber in the torque converter to reduce powertrain noise and vibration. Diesel models also feature smart diesel exhaust braking and an integrated trailer brake controller. Smart diesel exhaust braking enhances vehicle control and reduces brake wear by varying the amount of brakes needed for the vehicle, load and grade. The integrated trailer brake controller system works with the anti-lock brake system to provide immediate and measured brake force with the electronically controlled trailer brake system. 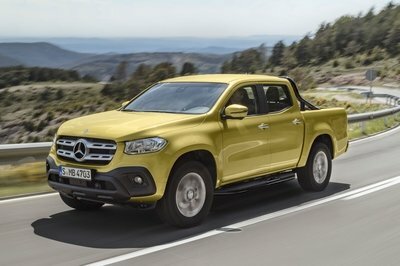 In 2015, Canyon won Cars.com Midsize Pickup Challenge for its segment-leading capabilities and efficiency, including the latest in safety features, cargo-hauling and trailering versatility. Autoweek named Canyon as the “Best of the Best Truck for 2015,” while WardsAuto recognized the Canyon as one of its 10 Best Interiors for 2015, based on criteria including design harmony, ergonomics, materials, driver information, safety and comfort. Named for Mount Denali, the highest peak in North America, the GMC Denali brand represents the pinnacle of luxury, design and performance – the ultimate expression of professional grade. GMC’s top-of-the-line models include the signature Denali chrome grille – premium materials and the latest safety and infotainment technology. Features such as a 10-inch reconfigurable instrument cluster on the Yukon Denali series and Magnetic Ride Control on Sierra Denali are exclusive to their respective vehicle segment. The luxury-focused Denali models outsell the entire product lines of some of the most aspirational marques, including Land Rover, Jaguar and Porsche, with almost 60 percent of all GMC Yukon/Yukon XL models and more than 45 percent of Sierra HD sold wearing the Denali badge. Overall, Denali vehicles have accounted for about 25 percent of all GMC retail sales in 2015 and more than 850,000 have been sold since the nameplate was introduced on the 1999 Yukon.